Color is messy; it is corporeal. It bleeds and overwhelms. It opposes the contained, neat, and clinical. It may show us the natural world in comparison to the manmade, or, in turn, it may become the hyper-real and psychedelic in our perception. The nature of the duality of color, the two sides of seduction, can result in desire or in repulsion. We want and love color, but even when we don’t, it creeps into us. Archer Gallery presents The Infectious Corruption of Color, an exhibition of works by Calvin Ross Carl, Laura Hughes, Sara Greenberger Rafferty, Amanda Wojick, and Mike Womack. Each artist deals with color in a combination of ways: through concept, formal relationships, personal experiences, visual perception, and experimentation. 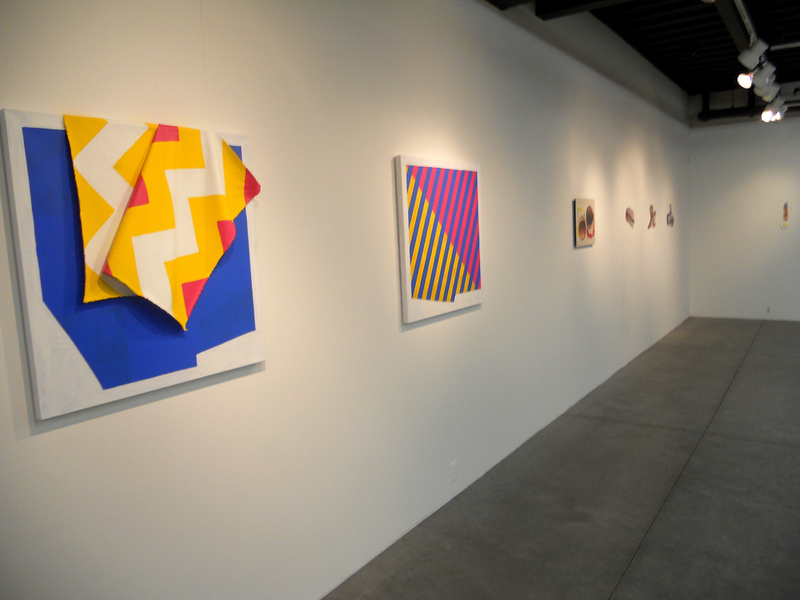 Calvin Ross Carl (Portland, Oregon) works formally with painting, sculpture, and installation. 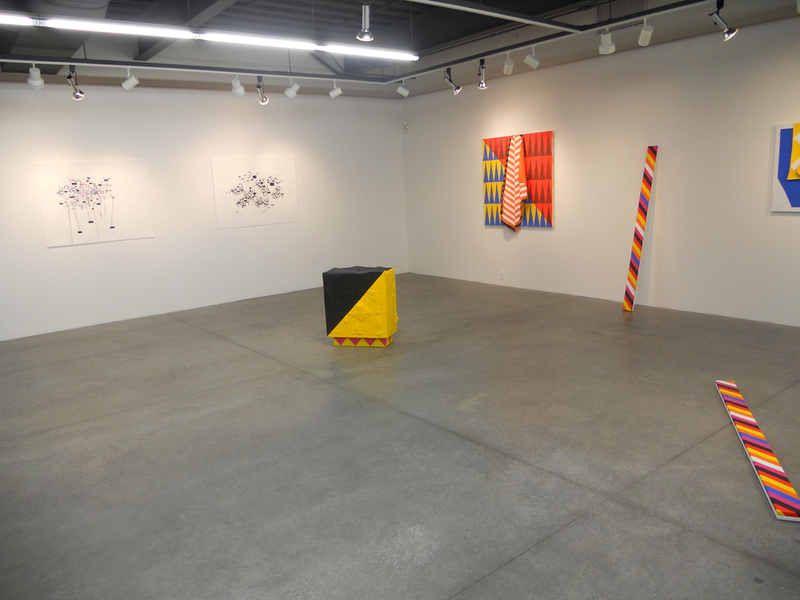 In this body of work, he continues his previous explorations of the color palette of hazard and safety warning signs. His hand is more present in this work, and without a severe and clean line. His formal pieces of color and pattern move away from an ordered and mechanical representation towards a human one, complete with nuance and imperfection. Laura Hughes (Portland, Oregon) creates site-specific installations of light and color, which highlight and address the subtle aspects of our visual everyday world. In this new installation, colored light and reflective paint are used to evoke a celestial otherworldly feeling. Sara Greenberger Rafferty’s (Brooklyn, New York) work addresses the frailty of the bodily using images of props of stand up comedy. Her works, printed from photographic images onto Plexiglas, combine the visual nature of realistic photos and abstract prints in a surprising way. Arriving at the violent, by way of the comedic, Rafferty addresses color in a variety of ways including nostalgia for past popular culture as well as the formal implications of stains and fluids. Amanda Wojick (Eugene, Oregon) intersects her visual language of abstraction in drawing and sculpture, where some two dimensional works appear to be plans for sculptures, and some exist as both a plan and a work in itself. In these new works, she measures time as abstract queues of records and reminders, using a palette of color collected from places she has spent her time. Mike Womack (Boulder, Colorado and Brooklyn, New York) replicates the effect that he sees, along with a small minority of people, of rainbows in his periphery when watching a digital projection. A built mechanism unravels the light projected from a digital projector into primary colors, and at times secondary colors from overlaps. The brightly colored photographs capture projections of black and white images that were taken from scientific and popular culture, visible in a new way.